As a movie, A Bullet for Joey (1955) isn't much. But for film buffs, its genre fusing of film noir and �50s anticommunism themes with �30s Warner Bros. style gangster melodrama featuring "the screen's top �tough guys'" (so said the posters) makes for a fascinating if deeply disappointing mix. The tough guys were Edward G. Robinson and George Raft, once big stars at Warner Bros. but who by the middle 1950s had fallen on hard times. Raft, a great screen presence but a famously stiff actor, had seen his fortunes tumble when gangster movies of the type popular in the �30s and then again briefly in the late-1940s fell out of fashion. Around this time things were so bad for Raft he was reduced to working as a greeter at the Capri Casino in Havana. Robinson, the bigger star, saw his career damaged though not destroyed by the Hollywood blacklist. He was called to testify before the House Un-American Activities Committee no less than four times during 1950-1954, on each occasion repudiating the left-wing organizations to which he had once belonged. (For reasons unclear to this reviewer, he was not asked to "name names. ")* Despite his cooperation the big studios remained wary of him; MGM's Big Leaguer (1953) was his only major film, and that lost money. Most of his film work was confined to relatively low-budget programmers for then-minor distributor United Artists, which also distributed A Bullet for Joey. Soon after, virulent anticommunist producer-director Cecil B. De Mille unexpectedly gave Robinson a plum role in The Ten Commandments (1956), which helped restore his reputation. 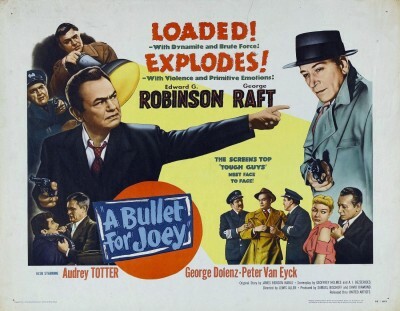 Besides Robinson and Raft, A Bullet for Joey boasts the kind of talent that would suggest a much better film than it is: a decent director (Lewis Allen, The Uninvited, Appointment with Danger), screenwriters (Daniel Mainwaring of Out of the Past, The Hitch-Hiker, and Invasion of the Body Snatchers, and A.I. Bezzerides of Thieves' Highway and Kiss Me Deadly fame), and one of noir's great femme fatales, Audrey Totter (The Postman Always Rings Twice, Lady in the Lake, The Set-Up). Curiously, A Bullet for Joey is set in Montreal. That was the setting for Stephen Brott's original Coronet story, "Canada's Great Manhunt," but for the picture Montreal plays little part in the narrative, and except for a handful of second-unit shots, the movie all too clearly was filmed in and around Los Angeles. Early one morning, a constable is found murdered and the prime suspect is an organ grinder, himself found murdered soon after. Inspector Raoul Leduc (Edward G. Robinson) investigates the baffling case, questioning atomic physicist Dr. Carl Macklin (George Dolenz, father of Micky), who passed the organ grinder outside his home while leaving for work. Meanwhile Communist spies are introduced, led by book dealer Eric Hartman (Peter Van Eyck, Five Graves to Cairo, The Wages of Fear). Too quickly it's revealed that the organ grinder was actually secretly photographing Macklin, but murdered by Hartman for bungling the job by murdering the constable. Hartman's chief henchman, Raphael Garcia (Steven Geray), decides to call in the big guns, contacting American gangster Joe Victor (George Raft), for years living down-and-out in exile in Lisbon. Garcia offers Victor $100,000 to kidnap Macklin, tossing in a new passport, identity, and a steamship ticket to America so that Victor can finally return home after the job is done. Brought to Montreal under the name "Earl Steiner," Victor calls together his old crew: Morrie (John Cliff), Nick (Joseph Vitale), Jack (William Bryant), and Victor's onetime moll, Joyce Geary (Audrey Totter), she initially wanting no part of Victor's scheme. Victor orders handsome young Jack to romance Macklin's bookish secretary, Yvonne (Toni Gerry), and pump her for information, while Joyce woos Macklin via a "chance meeting" at Macklin's golf club. After another murder, it becomes clear to Ludec that the crimes are all tied to Macklin's top secret work, and he begins to close in on the villains. A Bullet for Joey has a couple of good points: Robinson, as he was almost always, is excellent, nicely underplaying his low-key police inspector, though there's not enough of him and too much of Raft, whose character has no problem bumping off innocent bystanders but who unbelievably balks when democracy is threatened. Toni Gerry is also very good as Yvonne, an old maid but a smart cookie who realizes early on that Mike is only manipulating her. A murder at the film's halfway point is notably brutal and shocking. But despite the promise of the cast, key creative personnel, and the basic set-up, A Bullet for Joey's disparate elements never ever gel. Raft and his motley crew are real throwbacks to an earlier type of American cinema, though Robinson transitions well to the postwar (and Canadian) setting. Raft's once thin dancer's body was by this point a distant memory. Wardrobe unflatteringly emphasizes his pear-shaped pudginess. Totter later told the (probably apocryphal) story of the soundman picking up clanking noises when their respective steel corsets collided. If Raft was wearing one, it sure didn't do him any good. The film looks cheap and quickly made, probably the result of so much its budget going to the names noted above. It couldn't have cost more than $400,000 or so to make. Presented in 1.75:1 widescreen, approximating its original theatrical aspect ratio, A Bullet for Joey looks just okay, a bit soft and probably sourcing secondary film elements, but also likely the best the picture has ever looked since its limited theatrical release. The DTS-HD Master Audio (English mono only with no subtitle options) is likewise adequate, and the disc is Region A encoded. The lone extra is a few trailers. Not good, but worth seeing once for its stars and as an artifact of the �50s, A Bullet for Joey is a Rent It. * Reader Sergei Hasenecz adds, "Robinson's dealings with HUAC and the FBI were complicated and extremely frustrating, especially since he was essentially being persecuted for being a liberal Democrat (a political stand he never renounced) and for being a foreign-born (Bucharest) Jew. (Anti-semitism was a big factor in the Red witch hunts. When HUAC wanted a big Hollywood star to bring down, they looked at Robinson, Danny Kaye, and John Garfield. Garfield got the worst of it, as he was perceived as the most vulnerable.) Robinson had early on been against Hitler. Robinson campaigned for the part he played in Confessions of a Nazi Spy. He contributed heavily to anti-Nazi causes well before the start of World War II. This would later get him labeled as a 'premature anti-fascist,' and to hysterical anti-communists he was immediately suspect after the war." Stuart Galbraith IV is the Kyoto-based film historian and publisher-editor of World Cinema Paradise. His new documentary and latest audio commentary, for the British Film Institute's Blu-ray of Rashomon, is now available while his commentary track for Arrow Video's Battles without Honor and Humanity will be released this month.